Composites 2013 is under way at the Orlando (FL) Convention Center’s north hall. 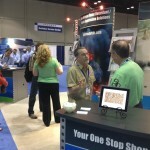 We’re in booth 633 and enjoying a great opening day by visiting with a number of event attendees. Please stop by and learn more about our calcium carbonate extenders, non-halogen flame retardants and smoke suppressants and cast polymer performance materials. 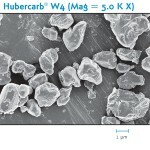 Learn more about Huber products like Hubercarb® W4 calcium carbonate and MoldX® optimized alumina trihydrate. We are looking forward to your visit! Huber's busy booth on the first day of Composites 2013 in Orlando. 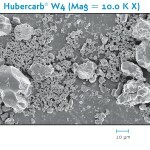 We will be talking about Hubercarb® W4 calcium carbonate next week at Composites 2013. Be sure and stop by booth 633 to learn more. W4 is milled from a unique micritic limestone ore. This soft and virtually silica-free ore also mills to a more spherical shape than conventional marble sources, which grind to rhombohedral forms. 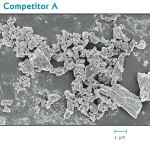 This provides for maximum particle packing and minimizes glass breakage during processing and molding operations. 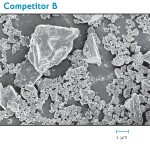 Look at the micrographs for Competitor A and Competitor B as they illustrate the sharp edges inherent in such crystal forms. In comparison, Hubercarb W4 mills to a more spherical form with far less sharp edges that can break glass fibers and introduct stress concentration points in the final product. Click on the micrographs to enlarge. For more information on W4, Contact Us! There’s a lot to do in Orlando, but One Thing You Can’t Miss. It’s Us at Composites 2013! There are a lot of places well-worth visiting in Orlando, but there’s one absolute must see you don’t want to miss. 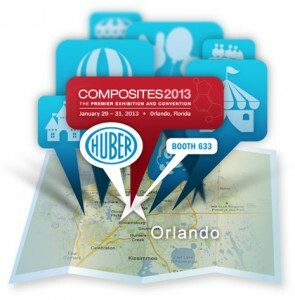 So when you’re making plans for Composites 2013 on Jan. 30-31, be sure to include a visit with us in booth #633. We’re excited to share information about our high-performing products and first-class sales support, technical service know-how and customer service. We’ll be discussing our high performing Calcium Carbonate Extenders, Fire Retardant Additives, and Cast Polymer Performance Materials. We are excited and looking forward to seeing you next week in Orlando! 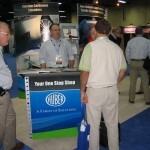 Huber's busy booth last year at Composites 2012 in Las Vegas. We look forward to visiting with you next week in Orlando.